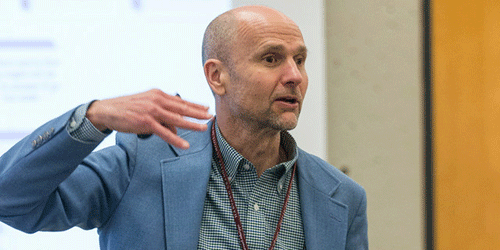 A new Ed School project led by Lecturer Lee Teitel focuses on growing truly integrated schools. The motivation came to Lecturer Lee Teitel while lying in protest on the floor of Gutman Commons following the court ruling on the shooting of Michael Brown in Ferguson, Missouri. When a doctoral student asked protestors what they could do to make a difference, Teitel reflected on his decades of experience working in school improvement and leadership, and how schools are levelers of society. He pondered: What if we could better understand each other? What if schools had better tools to dismantle racism? Would a case like Ferguson even exist? Then, he did something. Supported and encouraged by students, colleagues, and the dean’s office, Teitel first developed the course, The Promise of Integrated Schools. Now, a year later he has launched Reimagining Integration: The Equitable and Diverse School Project, an initiative that investigates and identifies a common vision for growing equitable, diverse, and truly integrated schools. “Despite 60 years of efforts to desegregate schools, our nation’s schools are more segregated today than they have ever been,” Teitel says. Through Reimagining Integration, Teitel is calling for schools to go beyond “desegregation” — what he calls “body counts” of students from different backgrounds — to true racial and socioeconomical integration. Working in collaboration with a diverse group of educators, advocacy groups, community organizations, and policymakers, the project ultimately aims to grow the number of quality schools where all children can have equitable learning outcomes, feel like their culture is valued, learn to live together with appreciation of differences, and be engaged in understanding how to dismantle racism and systemic oppression. The subject is paramount for Dean James Ryan, who came to HGSE with a long record of researching and working toward equity and civil rights. Ryan supported and encouraged Teitel to pursue the project after observing his new course on integrated schools last year. Since the 1950s, the Supreme Court ruled that racial segregation is unconstitutional, and while many schools worked to change their student demographics, little actually changed in how this played out inside classrooms across America. Growing up in Brooklyn, New York, in the late 1960s, Teitel, like many students of the past 50 years, attended a desegregated public high school. He estimates about 10 percent of the 5,000 students were students of color bussed into school. But he rarely interacted with any of these students because they were placed in different classes. “When people are different they get changed by [discovering] common goals and doing work together,” Teitel says, noting that integrated learning experiences can be powerful and life changing. In fact, Teitel credits an integrated afterschool program and summer workcamp he attended as a teenager to changing his life’s trajectory. It gave him an opportunity to interact, engage, and work with peers from different races, socioeconomic backgrounds, and cultures and learn about racism in ways that his “desegregated” high school did not provide. Decades later, in his eight years as director of the School Leadership Program (SLP) at HGSE, Teitel deliberately created integrated experiences for future principals. He tripled the percentage of students of color in the cohort (currently 45 percent), and created a community where students had the skills and opportunities to learn with and disagree with each other, and care for each other across differences. He worked with SLP students to identify and then develop the skills that would help them become transformative leaders around diversity and equity. These were subsequently adapted by the HGSE faculty as its Diversity Competencies. Teitel and his colleagues believe integration can become the tool Americans use to overcome racial and socioeconomic barriers. They argue that these barriers have created a country that fails to address issues of growing diversity and changing demographics of schools; unequal economic opportunities; regular killings of unarmed black and brown Americans by police; unfair treatment of students based on race/ethnicity in school discipline; stagnant test scores; and persistent gaps in graduation rates. Over the next year, the project will examine what integration means and what currently exists in education. The investigation will also look at collaborating with diverse partners to help identify and develop outcomes for equitable and diverse schools; surveying existing work in the field, current research, and policies tied to promoting desegregated and integrated schools; and cultivating a physical and virtual community to reimagine the outcomes and processes for diverse and equitable schools. This investigation of research, policy, and practice will help develop a clear set of commonly held definitions of how integrated schools are different from desegregated ones, as well as practices and approaches that will result in the development of more integration among diverse groups. Some of the research has already started. “There are a lot of pockets of people thinking about this but there hasn’t been a mechanism to bring people together,” says Suchitra Saxena, Ed.L.D. '15, who is conducting what she calls a landscape analysis to determine what the education sector needs, as well as what already exists and with whom HGSE might partner. “We are learning as we go along and trying to find out where there are schools, where people are doing this,” says Jennifer Kilson-Page, Ed.M.’90, who works as a teaching fellow for Teitel’s yearlong course on integration and is also leading the visits of integrated schools for the project. For Teitel and his colleagues, each visit to an integrated school is a pleasant reminder of the why they are doing this work. The project’s ultimate goal is to determine how to increase the number and quality of integrated schools like Community Roots Charter School that do the work well. “There’s a danger in integrating poorly,” McLean says, noting when integration isn’t done well it can reinforce bias and stereotypes.